Italy: the Bridal Chamber in Mantua- the Most Beautiful Room in the World? Dubbed ‘the most beautiful room in the world’ by Galeazzo Maria Sforza, the Duke of Milan, the Bridal Chamber (Camera degli Sposi) is remarkable not for soaring architecture or costly materials. In fact, it could be said that the beauty of this room is all an illusion as the walls and ceiling are entirely frescoed. When thinking of Mantegna masterpieces most will picture the Cristo Morto in the Brera museum in Milan, or perhaps his St Sebastian in the Louvre. But it could be argued that his greatest work, not least in size, is this Bridal Chamber of the Gonzaga family. 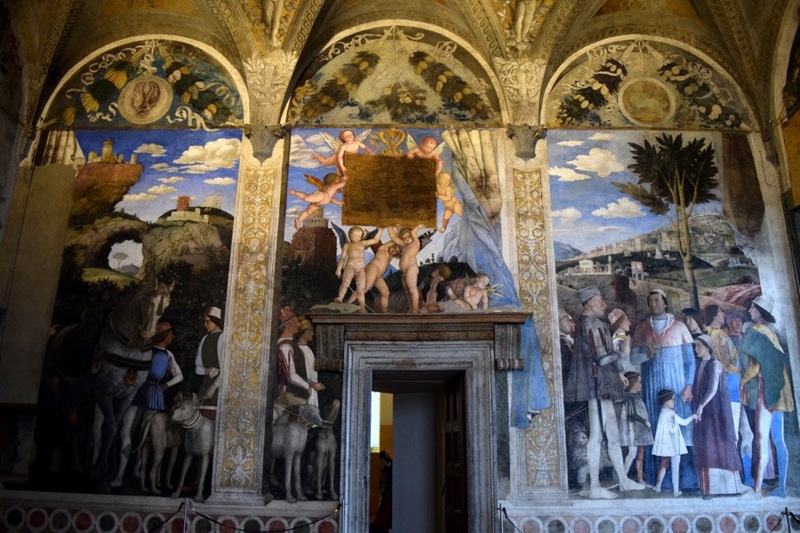 The frescoes feature characteristic extreme foreshortening, remarkably lifelike portraits and some delightful visual jokes. At the top of a tower of the Castello di San Giorgio in Mantua (Mantova in Italian), part of the Palazzo Ducale complex. Map. 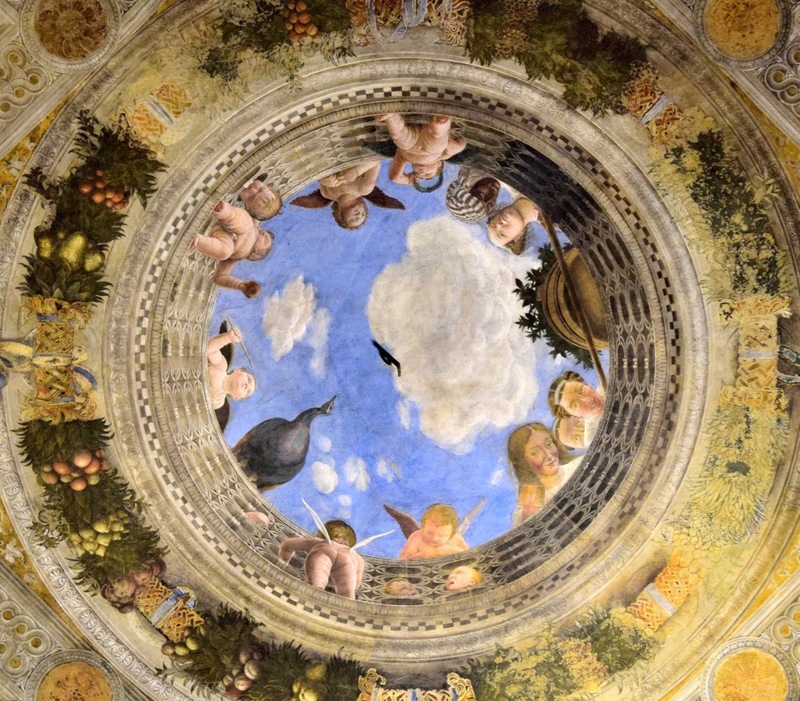 The Bridal Chamber (known in Italian as the Camera degli Sposi) is a masterpiece of illusion by leading Italian Renaissance painter Andrea Mantegna, and was commissioned by Marquis Ludovico III Gonzaga. The physical space is not expansive, but Mantegna's frescoes attempt to adjust this. On two walls three arches are painted and strung between are brocade curtains giving the illusion that there is a further space behind. The other two walls feature scenes acted within the arcade space, contained by a wall beyond which is a garden or outdoor space. 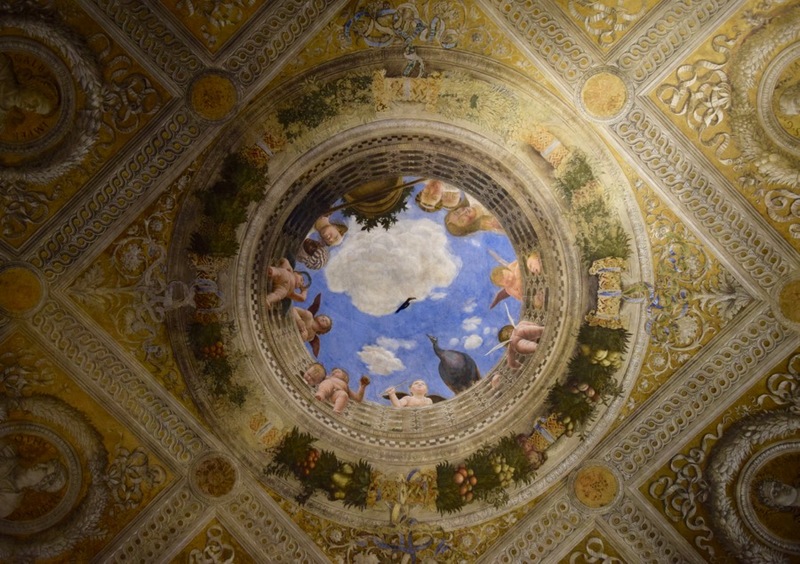 Perhaps the greatest architectural trompe l'oeil of the room is the ceiling. Inspired by the Pantheon, dedicated to all gods, Mantegna designed the ceiling with a central oculus opening to a heavenly blue sky, thus linking the earthly with the celestial and suggesting that the Gonzaga's rule was governed by divine guidance. Here he demonstrates his formidable understanding of perspective with several putti seen from directly below requiring extreme foreshortening. But it's not all serious. Peeking over the parapet are two grinning faces beside a barrel of fruit that is precariously balanced on a plank of wood over the opening, ready to be emptied onto the unsuspecting marquis in the room below. Watch out for falling fruit! The two scenes decorating the walls depict pivotal moments in Ludovico's public life. Mantegna chooses to set these scenes within the arcade space as though being enacted on a stage, accentuated by the curtains in front which seem to have been swept aside to reveal the drama. This implies that the Marquis's rule had acquired an almost legendary status, worthy of an eternal re-enactment like a famous historical play. Indeed to the left of one scene there are several figures who are entering from behind the curtain, from 'back stage'. In a sense it is a play within a play, with art mimicking drama mimicking real life. 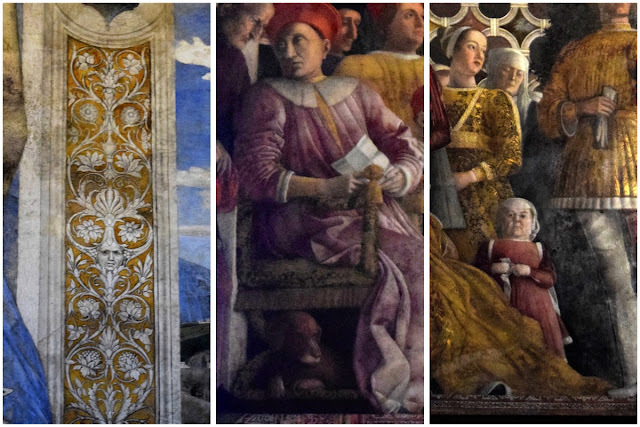 Being a room to receive guests, these scenes of Ludovico's life and family were not just for personal enjoyment, but to impress upon the visitor the power and heritage of the Gonzaga family. On the north wall the Gonzaga family is gathered together in a courtyard with the Marquis to the far left hand side. Although not central, his figure draws the viewer's eye as he twists in his throne to speak to a messenger, forming a peak of movement. He is pictured receiving an important missive from Milan, dated January 1, 1462, in which the Duchess of Milan, Bianca Maria Visconti, informs the Marquis of her husband Francesco Sforza's deteriorating health and urges Ludovico to join her as lieutenant general of the Lombard dukedom. Surrounded as the Marquis is by his family, the scene seems to be a clear portrayal of the growing power of the Gonzaga dynasty, flourishing like the orange tree blooming in the background. 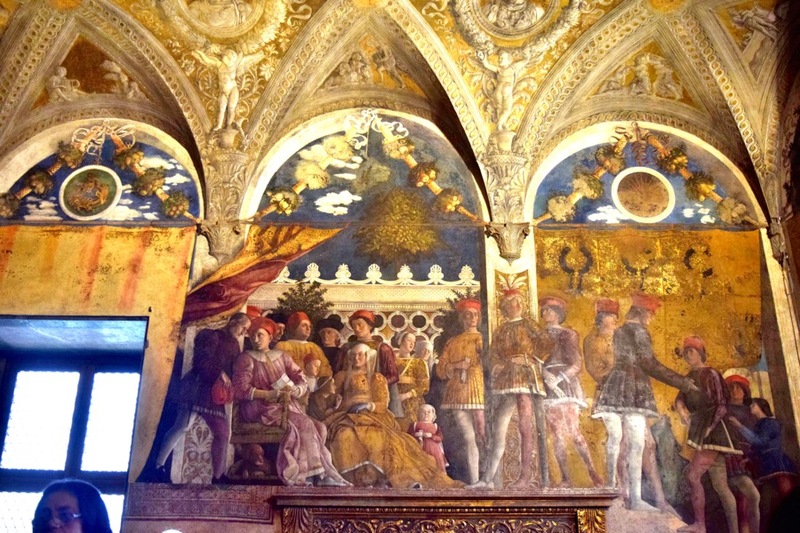 The adjacent wall presents the Meeting between father, Ludovico, and second son, Francesco, who has been made a cardinal by Pope Pius II. Ludovico, on the left side in profile, is mimicked on the right side by his eldest son Federico, also in profile, implying his forthcoming inheritance of his father's title and continuation of the dynasty. The presence of Ludovico's grandchildren yet further reinforces the importance of the Gonzaga lineage. 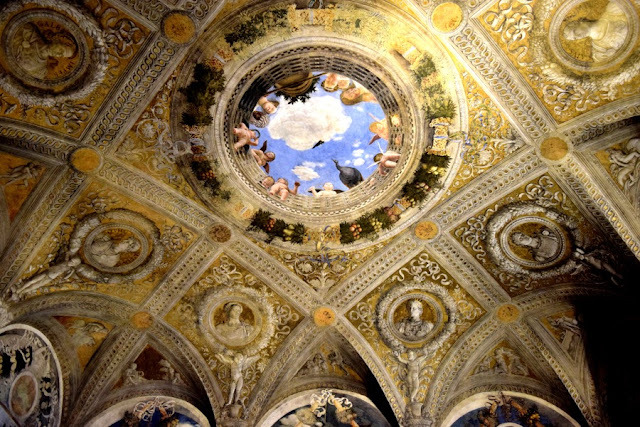 The ceiling is also decorated with frescoed busts of the first eight Roman emperors, gazing down ancestorially on Ludovico implying the strength and virtue of Gonzaga power derives from the legendary Roman era. The busts of Roman Emperors gaze down upon us mere mortals. Perhaps this imagery was to inspire Ludovico and to represent his family pride, but it is also undeniably a lesson in self-proclamation intended for his visitors. 1. A self-portrait of Mantegna peeping out from some leaves in the architectural decoration. 2. Ludovico's faithful bloodhound Rubino beneath his chair representing fidelity and the marquis' comportment in political and diplomatic relations. 3. La nana - the dwarf. Mantegna's cameo, Rubino the dog, and Nana the dwarf. Getting There:Mantova can be reached by train from Verona (45 minutes), Modena (55 minutes) and Monselice (1 hour 45 minutes). The railway station is not far from the town centre but you can also take the bus (line 4 or circular 1). The Palazzo Ducale is located in Piazza Sordello. - Official Website of the Palazzo Ducale / Castello di San Giorgio has ticket prices and opening times. Rebecca is the author behind the blog La Brutta Figura, where she shares her discoveries across Italy, from luxury hotels in caves to lemon groves on the Amalfi Coast. Travel to villages frozen in time, follow a bar crawl round Venice’s traditional pubs and find complete guides to where to eat the best of the local specialities.